Buy direct from the Roaster why buy from the middle man! It is because we import and small batch roast, that we are able to offer our clients the gourmet coffee market as experienced in the gourmet coffee shops. There are no additives or preservatives. 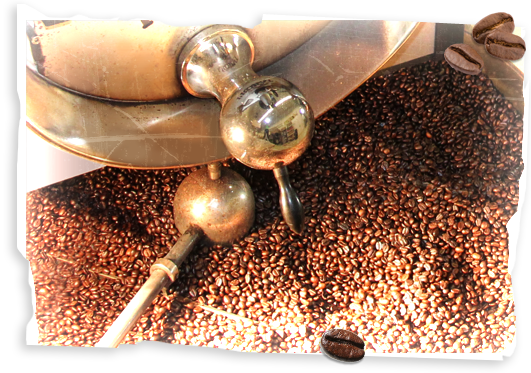 We roast daily for next day delivery in Toronto and the GTA. Our organic freshly roasted coffees are packaged in pla (a corn based polymer) lined unbleached kraft bags which are 100% biodegradable and compostable. It is the freshest, purest coffee you will ever experience! Although wonderful coffee is our niche in the marketplace, we realize that it must be supported with excellent service and attention to detail. We would be pleased to prepare samples of our freshly roasted gourmet coffees for you to experience. At Regency Coffee Company, we think you deserve the very best coffee in the world. It’s our belief and commitment that has distinguished our company and our coffee for more than three decades. From the very beginning, in fact we’ve done things differently, keeping our coffee production on a smaller scale and using time-honoured artisan traditions to produce the highest quality coffee. It’s a difference that starts at the source with exceptional coffee beans. We carefully roast each selection of beans at various intervals from light to extra dark roasts to capture the absolute fullest flavour potential. We use no additives or preservatives. The result is hot, flavourful and wonderfully aromatic coffee that consistently measures up to your expectations with every cup. We select green coffee (raw Coffee) beans that are sent around the globe in burlap sacks ranging from 130 lb to 154 lb sacks. These are then roasted by our master roaster specialist to bring out their subtle flavors. Once our beans heat up and turn glossy brown, the oil develops that are the absolute secret of their marvellous flavour. We roast from light brown through medium to very dark beans. Sometimes we even blend different percentages of all of them to make a unique and distinct wonderful blend. The art in this blending is to marry different beans together to create a harmonious balance of flavour, acidity and body. Regency is a specialized coffee supplier that prides themselves on their variation of Blends and single origin coffees. Through a very unique roasting process the larger roasters don’t even understand. Our Restaurant and office coffee love our classics such as mellow Breakfast Blend or a little stronger After Dinners, right up to our famous espresso. One of our most popular blends with office coffee and restaurants is the long standing combination called Mocha Java, which combines Aroma and strength with a wonderful smooth finish to make a delicious potent brew. It takes a lot of skill and constant cupping to create and maintain house blends, since even the beans from the same place will vary from batch to batch and from year to year. The secrets for making the perfect cup of coffee are quite simple, as long as you follow these simple rules. Buy freshly roasted good quality whole beans and grind them just before making a pot or cup. Grind the beans to a medium or fine grind. Make sure you measure the amount of coffee and water you are using and time the length of time it takes the machine to brew. Choose Regency for all your office coffee and restaurant needs. This is the purest highest quality coffee you will ever experience. Right down to the bio-degradable packaging, nothing gets more pure and natural than that. What better way to impress your office coffee and restaurant cliental. Truly believe when you offer your client a coffee it is a reflection of your establishment. Most of our coffee is grown within a broad geography band bordered by the Tropic of Cancer to the North and the Tropic of Capricorn just to the south. Within this region, there is an average of all year round temperatures of 70 degrees Fahrenheit, with a very little probability of frost. With an abundance of rainfall to provide the ideal amounts and conditions that coffee plants need to thrive. Out of many different species of beans grown, there are only two harvested for export worldwide. Also, the methods of cultivating vary from region to region and country to country. Two-thirds of the growers cultivate the very fine-flavourful and the most delicate Arabica bean. The Arabica bean is an elongated bean that requires an altitude of 3500 to 7500 feet above sea level. The other type of bean is called Robusta; this bean is generally a small and round bean which has a less refined flavour and much higher caffeine content and acidity. The Robusta bean is grown at a much lower altitude therefore is more abundant and much less expensive to harvest. This is why Regency chooses to supply all its restaurants, golf clubs and office coffee clients with the much superior Arabica species. The secret is having the correct master roaster and make sure you prepare the beans in small batches. Small batches are the key to the finest cup in the world and that is just another secret why Regency has such a fine product. Generally small batches are based on no more than 35 to 45 lbs. being roasted at a time. Some roasters consider 150 to 300 lbs. of bean to be small batches, this is simply false. Harvesting now a day is either mechanically or picked by hand, depending on the steepness of the terrain and the quality grade of the bean. Harvesting by hand is the superior method of picking only the ripest cherry bean to ensure a much superior product. The less expensive way is mechanically because you get ripe and unripe beans mixed together. This is why Regency hand picks the plantations we receive our beans from; to make sure the end result is our clients enjoy the ultimate cup of Java. Our clients in the Toronto and the GTA enjoy the extra attention to detail. Interestingly enough, most if not all pre-ground coffee that is sold in the supermarkets is a blend of Arabica, Robusta bean and even chicory, which are harvested mechanically. Chicory is a plant root which is a lot less expensive, but once ground up it looks just like coffee. If you are a coffee snob, Regency highly recommends purchasing your coffee always in the whole bean form. Which using a cup by cup or brewer machine this is the only way you can enjoy a fresh and flavourful cup of coffee. The most important thing to remember is don’t be fooled by any product that is pre- ground. Regency has a wide selection of coffee systems that can satisfy whatever your needs are, if it is for meetings, banquet halls, corporate, golf clubs or even retail, it does not matter if you simply want the best cup of coffee in the world. That is what we at Regency Coffee can do for you every day. Quite often after coffee testing or called cupping in the coffee world, it is compared to wine tasting. There has bean a whole vocabulary developed to describe and evaluate the different beans and brews. The most important thing as like with wine the initial indication of the freshness and quality is fragrance or aroma. A lack of this is a sign that the product is stale or past its prime. The aroma from a coffee cupping is sometimes referred to as spicy, fruity or flowery. In most cases a “well-tutored palate can distinguish the body of a coffee and the quality just simply by the aroma”. Regency chooses only the finest product that completely surrounds the mouth, without overwhelming it, and should be heavy enough to linger in the mouth a few moments after it is swallowed. Though not to be oily and thick, that if feels like it has left a coating on the tongue. Always remember that the strength of the coffee has absolutely nothing to do with quality. The strength can be altered by water temperature, fineness or amount of the ground bean and the time it takes to brew. Two of Regency’s main coffee producing countries that our clients in Toronto and the GTA get to enjoy Kenya and Costa Rica. We find Kenya very high quality and properly produced is one of the best. Banana trees are often inner speared with the coffee bushes to shade the tender plants and the cherries that grow on them. Most of the seeds that come out of these cherries are exported. With a deep wonderful flavour, intense winy after taste that marks many of these African varieties. The Kenya AA is the highest quality that comes out of Kenya. Costa Rica is also known for its high quality. These sturdy beans produce a brew that has a high acidity, a wonderful aroma. It is very well balanced and has a very smooth finish. This knowledge of coffee is why; we at Regency would make the prefect choice for your office, restaurant or any other coffee needs in the Toronto and GTA. Regency has coffee and service beyond expectations!